As you can see - I have gone totally mad!! "I'm new to twisty puzzles what should I buy?" "I've done a cube but what should I get next?" Very recently a very good puzzle friend of mine expressed a slightly wistful dismay that he couldn't possibly keep up with the collections of the guys he referred to as "the big boys". These guys have enormous collections of very expensive handmade or Shapeways puzzles which over a period will have cost them many $1000s. I expressed the opinion to him that his own collection was perfectly adequate - he did not want to get into debt and had a family to keep roofed, fed and healthy which of course should be his priority! So to him and to you I would suggest that with the twisty puzzles it should be about collecting and solving many puzzles that require different approaches and force you to think in different ways. I think that everyone in the whole world should own a cube! 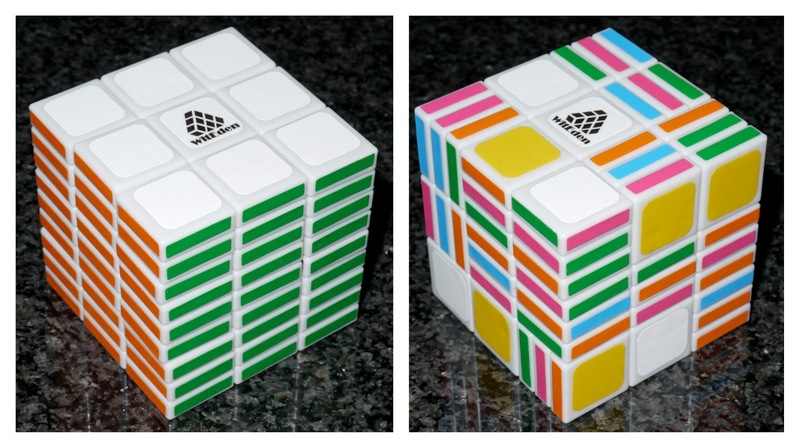 In fact, ALL puzzlers should own a 3x3x3 and a 4x4x4 cube (unfortunately I have yet to find a Rubik own-branded cube that turns nicely). The 3x3x3 teaches basic principles which can be used as a basis for many many other puzzles. In fact using these very simple principles and an enormous amount of thought my friend Rline has managed to solve and produce tutorials for about 100 different twisty puzzles - his site is one of the MOST IMPORTANT sites to go to for help and basic techniques - bookmark it and visit regularly! Why the 4x4x4? Because the majority of cubers solve the bigger cubes by reducing them to a very large (oddly proportioned) 3x3x3 and then solving that. BUT in doing so it is possible to create a 3x3x3 with edges that are either flipped or positioned in a way that would not have been possible on a normal cube - this is the dreaded "parity". It is only by decomposing and recomposing those parts that we can make the cube solvable. This sounds horrific - but after a while this becomes one of the most challenging parts of twisty puzzles and is great fun! Once you have these first 2 cubes you could go bigger (5x5x5 up to 11x11x11) or smaller (2x2x2) - these don't add anything to the solve process but you effectively have MORE! They can be quite fun but are not an essential next step - I have up to a 7x7x7 but nothing bigger as yet. So where should you go next, young Paduan? This can vary - if you are young and keen then maybe speedcubing is for you. The aim is to learn almost 1 million different algorithms and solve the cube in under 10 seconds! I'm afraid I am too old for that! I can barely remember who I am at times let alone learn all those algorithms. So I would advise my approach and branch out into the huge world of twisty puzzle variants and use the knowledge you have to solve as many as possibe (I probably only remember 12 algorithms in total and have learned to use them creatively). You can try shape modifications - these are basically a standard cube but the shape (or the axes) has been altered to throw off your thought processes. One of the very special features is that they often have "supercube aspects" where the centres have to have a specific orientation. These can be very challenging but once you have done a few then you do sort of get the hang of them. Start with 3x3 shape mods - Mastermorphinx (Tetrahedron), Blade cube (Rhombus), or a flip of axis with the appropriately named Axis cube and there are many others. 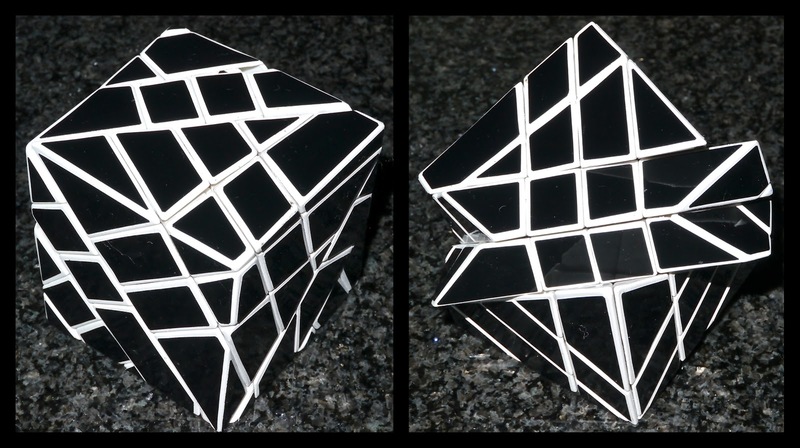 For 4x4 mods try Bindi's octahedron or a Mask cube, I am soon to receive a handmade 4x4 tetrahedron (the Megamorphinx). 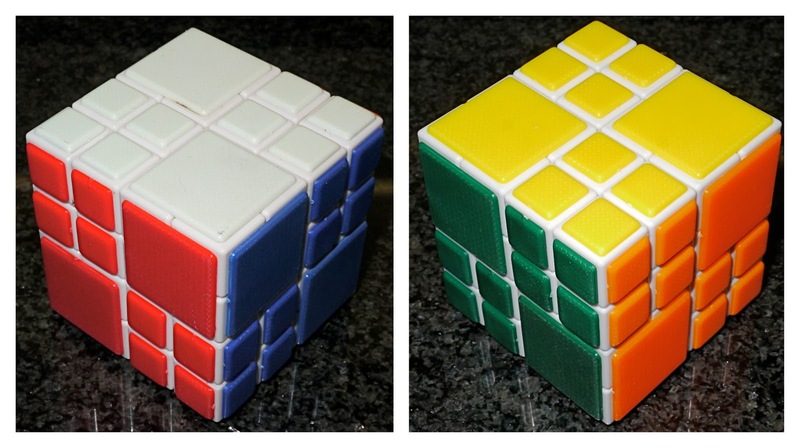 The ultimate mod is a ghost cube - here we have an axis modification and the cuts are not lined up when in cube shape! These are handmade and start at about $90 for the 3x3 and go up to $350 for a 5x5! Bigger mods are all handmade by some fantastic artisans but are VERY expensive! Fearsome isn't it? It taunts me from the shelf!!! Or there are cubic cuboids - cubes with asymmetric shaped cubies! They solve like a cuboid but can be very oddly shaped. I started with the 3x3x9 but now have several others. Surely that's enough!!! I can hear you shouting it at me from all over the world! Oh no - we've barely scratched the surface! Another way to go is to try some different shapes - 12 faces makes a dodecahedron and these are available in mass produced forms - the Megaminx is the usual beginning - it's a 3x3 equivalent with essentially a similar solve process to a cube (very slightly different). For these the Flowerminx/Kilominx is the 2x2, the Master Kilominx the 4x4. Going up is the Gigaminx (5x5), Teramix (7x7) and if you feel particu;arly wealthy and a sucker for punishment the Petaminx is the 9x9 version (a snip at $230!!!) Again there is little extra to be gained by going really big apart from show-off value and for collecting! So far these are all cubes and the variations on cube type solves - I loved them and they were a very major part of my entry into twisty madness. BUT they may not float your boat and there are still many alternatives! Rather than shape mods of a cube or moving to a face turning dodecahedron, you may choose to go for an alternative mechanism of function entirely! It was one of these which finally got me totally and utterly hooked. How about corner turning cubes? A shallow cut version where the cuts meet in the centre would be the Dino cube - I don't have one yet but I have a special edition of a slightly more complex version (the Dino cylinder by SmaZ - pictured to the right). A deeper cut (overlapping with each other) produces a really attractive cube with a really fun solution - this is the Rex cube. The ultimate in corner turning cubes has the deepest cut of all, effectively turning it into a skewed 2x2 cube - the Skewb. Even more interesting (and I hooked a few colleagues at work with them) are the edge turning cubes - the Helicopter cube or the Curvy copter) - I absolutely love it! This is where my advice to a beginner would stop! Surely not you cry - there are many more to try! You would be right but this article is primarily aimed at the general puzzler who I would like to entice into a really fantastic challenging area or the newbie who just wants to see where the Rubik thing might take him! Start with a 3x3 speed cube, a 4x4 speed cube and maybe a 5x5 cube to say you can. If you don't like it then they are a good part of a collection anyway! Next would be a 3x3 mod like the Mastermorphinx. And finally in my initial selection would be one or two alternative mechanisms - I love the rex cube and the Curvy copter (they are just fun to solve). What about the next step? I am absolutely staggered that in less than a year I have reached this level and even beyond! It will take you to the true realms of twisty puzzle madness. You might want to go for the Crazy cubes which have circles within them - I adore them but they are not for the faint-hearted or beginners - they can be very very tough! I have reviewed a few here. In fact since that review I have bought many more including cuboids which are crazy too! Of course, there are the very odd shapes - the Dayan gems were reviewed by me here. and the various Dayan stars have been introduced by Rox here. Some of these are on my shopping list. At the moment I am playing with bandaged cubes - they are very tough because everything you have learned before can be blocked due to the bandaging. My recent challenge was the 4x4x4 AI bandaged cube and I am currently playing with a 3x3x3 bandaged kit which allows me to construct my own - hours, days, weeks and months of puzzling fun! Phew!! That's quite a list and a huge amount of information! I really hope you find this helpful! Can you tell that I am really into these? They start cheap, provide hours of fun, are repeatable many times but can get very very complex and very very expensive! Go on - go out and buy some and try them! Do let me know your thoughts on this topic - it has really become one of my passions (this article alone has taken several hours to write) - I have not learned millions of algorithms. What I have done is learn a few useful techniques and then applied them to many other cubes/shapes and puzzles. Tell me how you get on through my contact page. I usually provide list of links to those who contact me for advice and I will repeat it now. Browse the Twistypuzzle forums - we are a nice bunch!! You can lurk for ages but to post and join the community you need to apply - be patient, the requests are hand vetted and this can take a while! Rline's twisty puzzling site - this is the best tutorial site there is for many many different puzzles - it will take you through a very basic system (from there you can branch out to learn more techniques as you need them. 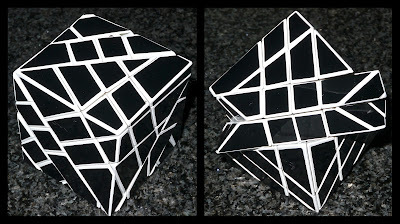 http://www.youtube.com/user/SuperAntoniovivaldi/videos - Jon has tutorials on a huge number of mass produced and handmade puzzles. He will also produce videos specifically to help people who are stuck on a particular aspect of a puzzle. Kevin that is a great post! Can I suggest not just going to your one size fits all store but shopping around a bit. In HK for example, SmaZ sells at iq-puzzles, Meffert's has his own webpage, Eureka is in the US....The list goes on. Shall I give you more???? I'm teasing you into being tempted to buy buy buy! Go on, you know you need more! Thank you Rox! It took me a VERY long time to write this one. I have really only provided links for the places that I have personally bought from! I am aware of all the others but won't recommend anyone I don't have personal experience of - especially if I'm trying to entice beginners. I'm sure the others are fine but I would feel guilty if a newbie had a bad experience because of me! Tempted to buy buy buy? Oh yes - you have cost me a fortune young lady with your temptress suggestions! She is a devil woman! Twisties could not be more mechanical, they are truly mechanical with sliding, meshed, interlocking and geared parts. I am not obsessed with twisties but buy them ocassionally in batches over the years. I doubt I have any of value but that not the point for me. I do have a soft spot for ball twisties. I would like to aquire an 11x11x11 at some point as I have at least one copy of all of the variants up to this number. But as you say there is a whole other world of puzzles out there Kevin and like you they also need my attention as well. Is this your way of 'giving thanks for twisties' to the rest of us puzzlers? A fine review/statement of intent/fanboy appeal! I also would like to get some of the bigger cubes - the 11x11 has proven to be a little unstable apparently but the recently produced 9x9 by Shengshou is reputed to be top quality. You cannot have too many puzzles! And a significant proportion should definitely be twisty! You will love them! The 3x3x9 was my second cuboid after the 3x3x2. I can do it now very fast and it really isn't that difficult at all but it is still one of my favourites! Plus the Rex cube and Curvy Copter are FABULOUS. I still pick them p and do them now! For a smooth-turning 4x4x4, try a Ghost Hand II. And my favorite 3x3x3 is a DaYan 4-Lun Hui. And for a great-turning megaminx, I recently got a DaYan model with solid colored plastic and ridged corner pieces. And if you don't have one, get a LanLan master skewb! I agree with you, Rob! But then you are like me - you are one of the crazy ones! I will have to add those puzzles to my personal collection! Remember my post is aimed as advice for the beginner in twisty puzzles! Very very good post. I (chareaves=rline) can confirm that it definitely is the dark side! It's a lot like the Hotel California...except that you don't want to leave. It's difficult to remember what life was like before twisties. It was all dull and lifeless, and then I found twisties. I saw the light! And now I'm stuck on the dark side. It's my pleasure Rline! Those of us on the dark side love it and there's plenty of room for more! See everyone? Even Rline himself agrees with my advice - come on over and have fun with us! Awesome guide and a wonderful twisty family you got there Kevin! I suppose I’m in the main group, but definitely getting more twisties after solving the 3x3x3. Currently brought a 4x4x4, a 2x2x2, a Pyraminx, and a Mirror Cube-Also had a Void Cube on order. I’d try to acquire a few more according to this post, but as of now I know only the algorthms for 3x3x3s and am yet to know how to apply it to others. Still am new to this world! Welcome Wil, it takes a little while to learn enough to start applying them elsewhere and you will need a few extra ideas for the cuboids! After that you begin to fly! Remember, there's a big community of people who can offer help and are not in the least bit condescending. We want others to enjoy our puzzles too! Kevin, exceptional article! It has been very helpful, and gave me lots of ideas of what to get next: a Curvy Copter, a Diansheng Shield Cube and a Dayan Gem IV. I wanted to get much more, but had to establish myself a monthly budget, otherwise my wife would make me permanently sleep on the couch (it's every other day currently - lol). I noticed you didn't delve too much on the Skewb family, of which I'm a great fan. Meffert's has a good variety of these, for reasonable prices. Other 'families' I have yet to make up my mind are the 'Crazies' ( the 3x3 'planets' and the Dayan Pentahedrons) and the Cubic Cuboids. There are so many choices, I don't know where to start, or even if I should start at all. For the time being, I'm sticking to the known path - I have over 30 twisties so far, I better get bored of them first, right? I'm glad I could help Ricardo! You will really enjoy the puzzles you have just bought and it is right to set yourself a budget that you can afford! In the grand scheme of things these are just toys and we have responsibilities to friends and family that transcend these toys - getting into debt for them is wrong! Should you start at all? OMG YES! These puzzles are cheap and great value for money - you cannot go wrong! I do have a Skewb and have mentioned it here and will soon be reviewing the Golden Egg which is based on the Skewb. I plan at some point to buy the Master skewb as advised by Rob further up in the comments here. As for the crazy cubes - I absolutely LURVE them! I reviewed a whole lot of them here. I would absolutely try the Crazy 4x4 II cube - it is wonderful! All the cuboids are also fantastic - watch SuperAntoniVivaldi's classification that I linked to. Keep going and do let me know how you get on! Kevin, the Crazy 4x4 II is high up in my wish list, and it has been for quite some time now. On the other hand, its higher price tag, and other 'must haves' in my list keep me from ordering it. Like yourself, I have recently given in to the Tuttminx DIY sale - but I have ordered not one, but two(! ), one regular and one Classic. Maybe I'll assemble one of them and sell it afterwards, and then I might start getting my feet wet in the Crazy cubes. As a matter of fact, as I mentioned in my other comment, I'm currently getting a Dayan Gem IV from Dealmaz.com, for a little over $35, with free shipping - you see, all these 'one-time deals' keep trumping regular offers like the Crazy 4x4. I just missed another one on Deal Extreme: a Shengshou 8x8 for $60, now it's gone, and I regret not taking it. Hahaha... I think metagrobology is infectious and leads to insanity! Take care! Ricardo, the insanity began a very long time ago for me and I am hopelessly lost! But still having a lotta fun!!! I personally keep a ranked list of puzzles I fancy and puzzles I really must buy and then I choose from each list when placing an order. I don't often get to see the real bargains because I tend to shop in only one or two stores - maybe I should keep an eye out for the really great deals? If you see any in future then do let me know! Awesome puzzle it helps me a lot in many ways. I am glad to be of help! Speedcubing requires nowhere near as many algorithms as you say. I know only 50 or so, and I average 19 seconds. 50 Algorithms? OMG! I barely remember who I am! I can never manage that! I manage to solve most of my puzzles using mostly about 10 algorithms and occasionally 1 or 2 more. If I need anything special then I can design a commutator for 3-cycles on the complex puzzles. Apart from the number of moves - I hope you agreed with the rest of my post.